« How can we reduce losses from coastal storms? Monitor the health of our coasts. The company’s largest source of greenhouse gases is methane emitted from open manure lagoons. Here’s how this commitment will turn that liability into an asset – and how we can ensure that it delivers the full potential benefits of the change. 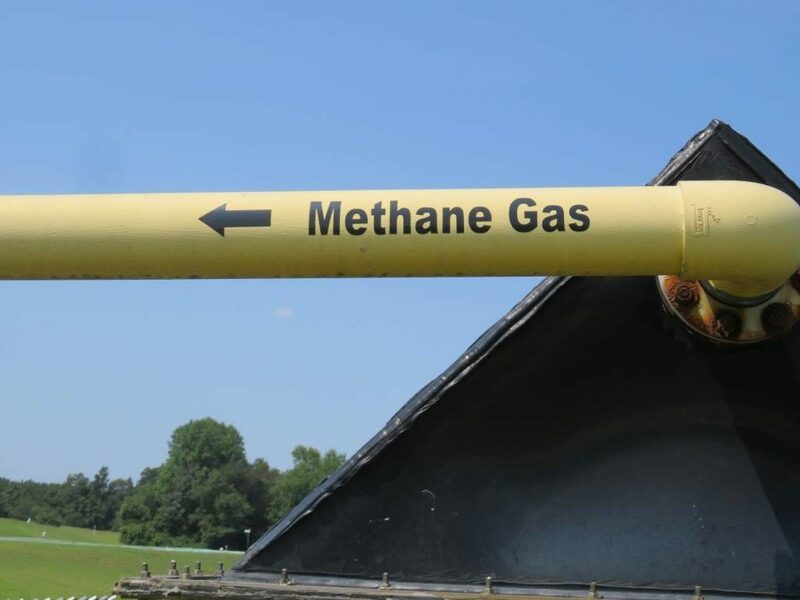 In addition, the methane can be used as renewable biogas, a replacement for conventional natural gas. The biogas is collected from the covered lagoons and digesters and then can be injected into natural gas pipelines to generate electricity, provide transportation fuel or be used for manufacturing. Smithfield set the stage for this new commitment in 2016, when it announced an industry-leading greenhouse gas reduction goal as part of its partnership with Environmental Defense Fund. Implementing lagoon covers and digesters at scale will help Smithfield exceed its goal to reduce supply chain greenhouse gas emissions 25 percent by 2025. Biogas has the potential to attract new manufacturers to the region and spur rural economic development. The devastation of Hurricane Florence focused national attention on North Carolina’s hog industry, the second largest in the country. While there were multiple sources of water pollution caused by catastrophic flooding, the vulnerability of open manure lagoons to heavy rainfall was evident. Farmers and their neighbors anxiously watched the rainfall totals in their area, and 40 farms experienced lagoon overflows or breaches. What doesn’t regularly make the headlines, however, is the ongoing challenge of managing lagoon liquid levels. Even without a catastrophic hurricane, farmers must pay close attention to increasingly variable rainfall and make sure the amount of manure effluent in the lagoon does not rise too high. Covered lagoons and digesters protect farms from excess rainfall. Following Hurricane Florence, farms with lagoon covers and digesters simply pumped the rainwater off covers after the storm and resumed normal operations. This technology is not appropriate for hog farms located in the highest-risk areas for river flooding. For the much smaller number of farms in the floodplains, North Carolina’s hog farm buyout program is a better option. While lagoon covers and manure digesters offer significant benefits to farmers, the environment and nearby communities, they are not a silver bullet. The impact of such a major technology transition on local water quality and odor is less clear, and these impacts must be measured and then addressed through additional management or technology improvements. For example, open lagoons emit ammonia nitrogen gas, which can contribute to water pollution and human health impacts such as asthma. Covers prevent nitrogen from escaping into the air, but they keep nitrogen in liquid form, which presents other advantages and challenges. Farmers use liquid nitrogen from both open and covered manure lagoons as fertilizer for crops. Lagoon covers reduce the risk of overtopping during excessive rainfall, which allows farmers to manage manure nitrogen more precisely and maximize crop uptake. It may also allow them to replace synthetic fertilizer with manure nitrogen. However, because covers prevent the loss of nitrogen gas, covered systems require farmers to have sufficient land to absorb twice as much nitrogen fertilizer as would be necessary with an open lagoon system. If farmers have too much nitrogen for their available cropland, they may need to add additional treatment technology. These potential trade-offs must be analyzed to ensure that the net result is improved water quality. Smithfield’s commitment provides leadership for the industry, marking a shift away from open lagoon systems. This progress in making agriculture more resilient to a changing climate is welcome, and continued efforts should focus on improving environmental and economic outcomes for farmers and communities. This entry was posted in Climate Resilience, ecosystems, fertilizer, Partnerships, Supply Chain, Sustainable Agriculture and tagged Climate, flooding, hog lagoons, hogs, lagoon covers, manure, manure digesters, manure management, open lagoon, rainfall, resilience, Smithfield, Smithfield Foods. Bookmark the permalink. Both comments and trackbacks are currently closed. North Carolina has a moratorium on new hog farms that do not meet a legislative definition of Environmentally Superior Technology. Biogas does not meet that definition.